The third in an ongoing series of entries about vintage sports identities. Sports fans, as I have often said, are the most ardent brand loyalists on the face of the earth. There are stories to be told here at the intersection of art, commerce, history, and fandom. The NBA recently announced that as many as five teams will be wearing short-sleeved jerseys in the coming 2013-14 season. This sleeved expansion builds upon the example of the Golden State Warriors, who became the first modern NBA team to wear sleeves last February 22. 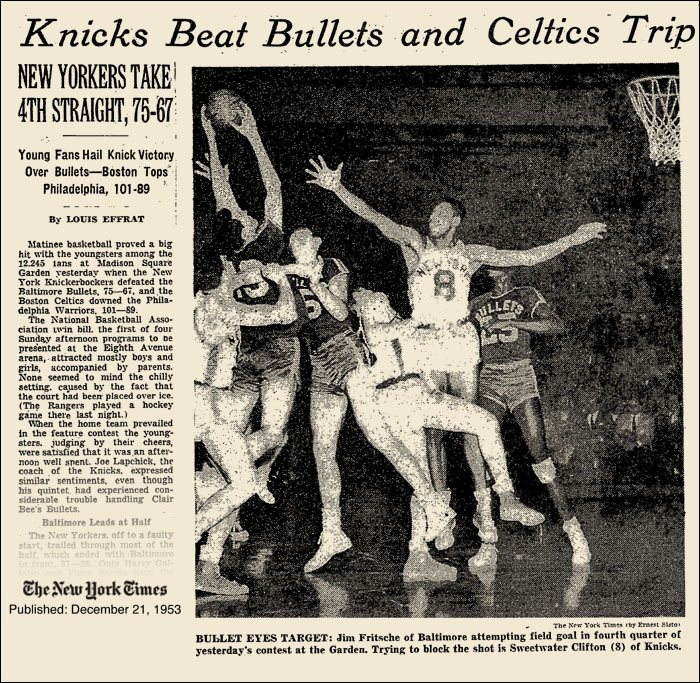 Prior to the Warriors, the last NBA team that covered up their shoulders was the 1954 Baltimore Bullets. In addition to being the last NBA franchise to wear sleeves, they were also the last NBA franchise to fold. There aren't too many graphics associated with this Bullets franchise, but there are some interesting and noteworthy visual and marketing highlights from their lifespan. Their logo featured a speeding bullet piercing a basketball. This is something that we definitely would not see today. They used three different colored uniforms during the 1953-54 NBA season. A 1990 Baltimore Sun article quotes '54 Bullets player Paul Hoffman: "By that point in the season, (coach Clair) Bee had changed the team's uniforms three times...We'd always used navy blue and mustard yellow on the road," Hoffman said, "but Bee didn't like that, so he went and bought us solid black road uniforms. But we lost so much he said, 'Shoot, you look worse in black than yellow and blue,' and went and bought cardinal red." A brand of athletic shoe was named for a later version of the team. 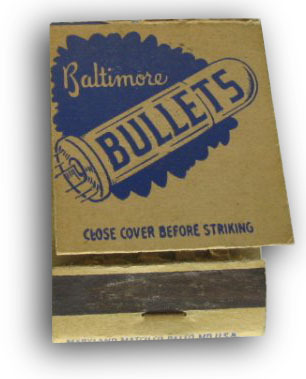 Conjecture has had the Baltimore Bullets named for the historic Baltimore shot tower, the Baltimore Armory, area munitions factories from the World War II era, and a speeding train, but in 1964, the Bata Bullet athletic shoe was named for the team. 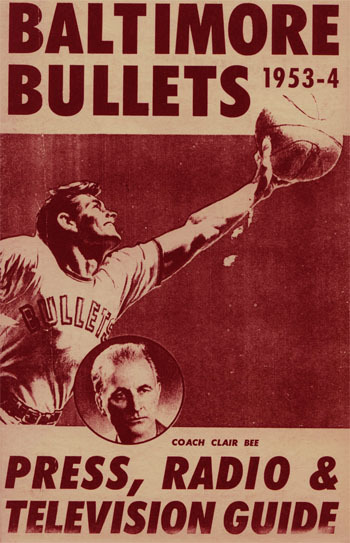 The original Bullets franchise was founded in 1944 as a member of the American Basketball League. 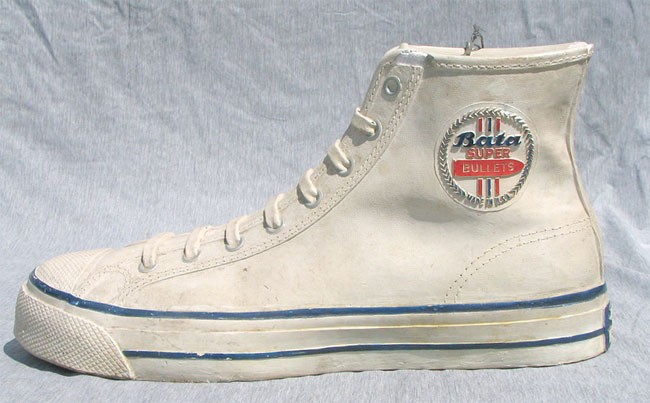 The Bata Bullet sneaker, made in nearby Belcamp, Maryland, was named for the NBA team in 1964. Bata was founded in 1894 in the current Czech Republic. The Harford County factory opened in the 1930s and soon became a haven for Czechs fleeing Nazi-dominated Europe. This June 1965 ad from Ebony Magazine notes the fact that "Bata Bullets were chosen for professional use by the Baltimore Bullets of the N.B.A." This Bullets team was formed in 1961 as the Chicago Packers and are known today as the Washington Wizards. Their original 1944 colors were maroon and gold. The team won the NBA championship in 1947-48. They lost 32 consecutive road games from Jan. 2, 1953-March 14, 1954. Despite this amazing achievement they actually made the playoffs in 1952-53. "We didn't have enough money to get back to Baltimore. We'd run out of meal money, expense money, didn't even have enough to pay for the hotel. The hotel manager called and said, 'Don't leave until you pay.' I called the airport and told them to hold the plane, and we hired a limo that came around to the back of the hotel. We slid the bags out, jumped in and took off. "The plane was waiting for us when we got to the airport. We went through a side gate of the terminal, took the baggage right onto the plane, and they closed the door and took off. We made it back and I never paid for the limo or the hotel." Now then-what do we think about NBA uniforms with sleeves? © 2018 Todd Radom Design. All rights reserved.